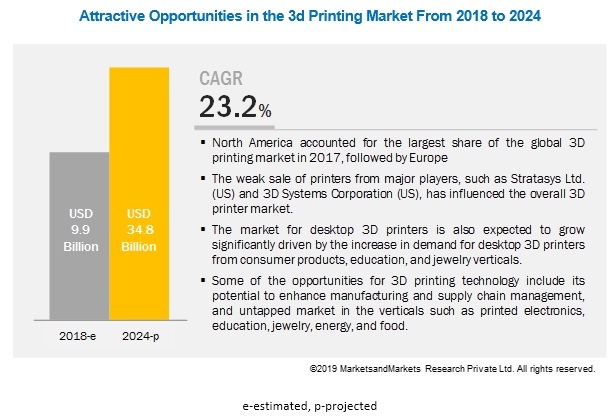 [240 Pages Report] The overall 3D printing market is expected to grow from USD 9.9 billion in 2018 to USD 34.8 billion by 2024, at a CAGR of 23.25%. Ease in the development of customized products, reduction in manufacturing cost and process downtime, government investments in 3D printing projects, and development of new industrial-grade 3D printing materials are the key factors driving the growth of this market. The service segment accounts for the largest share of the 3D printing market based on offering. The projected growth of the market for service is attributed to the expected increase in the demand for custom design and manufacturing. The market for 3D printing has been growing at a significant rate with rapid progress in the verticals such as healthcare (including medical, orthopedic, and dentistry), aerospace, and automotive as these are the early adopters of the technology. However, with the advancement in the printing technology and materials, the 3D printing service sector is garnering significant traction as a source of profit generation, compared to printers and materials. Power bed fusion process accounts for the largest share of the 3D printing market. The growth of the 3D printing market for power bed fusion process can be attributed to the ability to produce complex geometries, high-feature resolution, good strength, and decent surface finish. The 3D printing procedures based on powder bed fusion process in the aerospace, automotive, healthcare, and engineering verticals more commonly use technologies such as direct metal laser sintering (DMLS), electron beam melting (EBM), selective heat sintering (SHS), selective laser melting (SLM), and selective laser sintering (SLS) are most commonly used for the development of functional parts. Prototyping application accounts for the largest share of the 3D printing market. 3D printing helps produce prototypes and models from 3D computer-aided design (CAD). This helps several companies to reduce wastage during prototype transitions in traditional manufacturing and also helps them to bring down their operational costs. 3D printing also enables the quick production of cost-efficient prototypes based on the customer requirements regarding the geometry of the structure, accuracy, and well-defined smoothness of the products used in any industry. A few major companies in the 3D printing market are Stratasys (US), 3D Systems (US), EOS GmbH (Germany), GE Additive (US), Materialise (Belgium), SLM Solutions (Germany), ExOne (US), Voxeljet (Germany), HP (US), and EnvisionTEC (Germany). Inorganic growth strategies such as agreements, partnerships and collaborations are the focus area of many of the above. Prominent players have adopted agreements, partnerships, and collaborations, followed by product launches and developments, as the key business strategies to strengthen their positions in the 3D printing market. For instance, in September 2018, Stratasys (US) extended its collaboration with Team Penske (US) for offering FDM AM (by using Fortus 380mc Carbon Fiber Edition and Stratasys F900 Production 3D printers) for advance car testing, and production of prototypes and functional parts based on advanced materials, such as carbon fiber-filled Nylon 12. In September 2018, EOS GmbH (Germany) launched EOS M 300-4 metal 3D printer. The printer features 4 lasers that offer variable laser power sources, from 4 × 400, to a mixed set-up of 2 × 400 and 2 × 1,000, up to 4 × 1,000 Watt laser power. In December 2017, Arcam, a subsidiary of GE Additive (US), opened a manufacturing facility at Härryda, Sweden. The facility is expected to strengthen its machine production capacity and allow for a more collaborative set-up within the company, uniting logistics, research and development, services, and operations. In January 2017, 3D Systems (US) acquired Vertex-Global Holding B.V. (Netherlands), a provider of dental materials worldwide, which offers products (photopolymer, thermoplastic, polymer, and monomer materials) under the Vertex and NextDent brand for traditional and 3D printing dental applications. What are the upcoming trends in the 3D printing market? What are the opportunities for the players present now and for those planning to enter at various stages of the value chain? How will the inorganic growth strategies implemented by key players impact the growth of the 3D printing market, and who will have the undue advantage? What are the emerging industrial applications of 3D printers? The 3D printing market size estimation procedure involved 4 major activities. Exhaustive secondary research was done to collect information on the market, peer market, and parent market. The next step was to validate these findings, assumptions, and sizing through the primary discussions with industry experts across value chain. Further, top-down and bottom-up approaches were employed to estimate the complete market size. Thereafter, market breakdown and data triangulation were used to estimate the market size of segments and subsegments. The research methodology used to estimate and forecast the 3D printing market begins with capturing data on revenues of key vendors in the market, through secondary research. This study involves the extensive use of secondary sources, directories, and databases (such as Hoovers, Bloomberg Businessweek, Factiva, and OneSource) to identify and collect information useful for a technical and commercial study of the 3D printing market. Vendor offerings have also been taken into consideration to determine market segmentation. The entire research methodology includes studying annual reports, press releases, and investor presentations of companies; white papers; certified publications and articles from recognized authors; directories; and databases. The 3D printing market comprises several stakeholders, including the suppliers of standard components and original equipment manufacturers (OEMs). 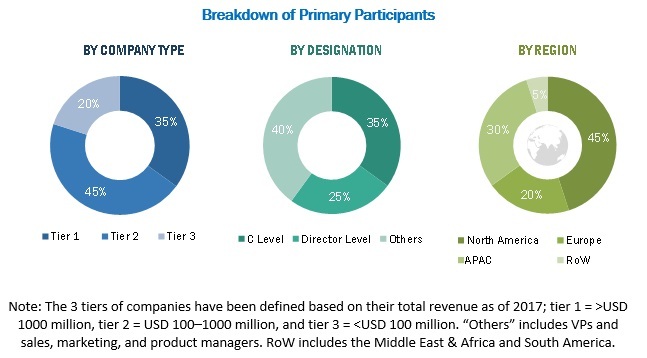 The demand side of this market comprises the users from aerospace & defense, industrial, healthcare, consumer products, automotive, jewelry, education, energy, architecture and construction, printed electronics, and food and culinary sectors. The supply side is characterized by the providers of advanced technologies with 3D printers for a diverse range of applications . Various primary sources from both supply and demand sides of the market have been interviewed to obtain qualitative and quantitative information. Following is the breakdown of primary respondents. The industry’s supply chain and market size, in terms of value and volume, have been determined through primary and secondary research processes. After arriving at the overall market size—using the estimation processes explained above—the market was split into several segments and subsegments. To complete the overall market engineering process and arrive at the exact statistics of each market segment and subsegments, data triangulation and market breakdown procedures have been employed, wherever applicable. The data have been triangulated by studying various factors and trends in both the demand and supply sides of the 3D printing market. This report segments the 3D printing market based on offering, process, application, vertical, technology, and region. Which new application areas are being explored by 3D printer providers? Which are the key market players and how intense is the competition in the overall market?